I participated in my first TasteLive event this past week with a small group of friends in downtown Orlando. The event, a tasting of Finger Lakes Pinot Noirs was coordinated and hosted by Lenn Thompson, founder and chief editor of the popular New York Cork Report, in conjunction with the Finger Lakes Wine Country Tourism Marketing Association. I received an invite to participate from Lenn and immediately jumped at the opportunity. Although I focus on the other 46 states, New York wines are a personal favorite of mine, and unfortunately do not receive the due attention they deserve (sound familiar). That said, events like TasteLive and websites like the New York Cork Report are helping to bridge this gap. Before I announce the group results, I thought I’d share a few thoughts and tips from my first TasteLive event. Tweeting, entertaining, and tasting wine is not as easy as it sounds. Between the tweets and dealing with technology issues (more on that in a minute), entertaining friends can be a challenge. Thank goodness I had my wife to play that part. Ensure you have a nice cheese and fruit spread. Always fun to see how a wine changes when paired with the right foods. Although I kept my cool, I missed a large number of tweets, even though I had multiple hash tags (#FLXwine, #TTL) and groups set up in TweetDeck. I assume these problems were attributed to TweetDeck, so any recommendations for a new Twitter client are welcome. Last but certainly not least, save a pour for day 2. Although the real winner of the night was the Finger Lakes wine region, the group did come to a unanimous decision. From the nose to the finish, the Ravines Wine Cellars 2007 Pinot Noir displayed beautiful balance, structure and complexities that seemed to resonate among the group. Coming in second was the varietal-correct Damiani Wine Cellars 2008 Pinot Noir. 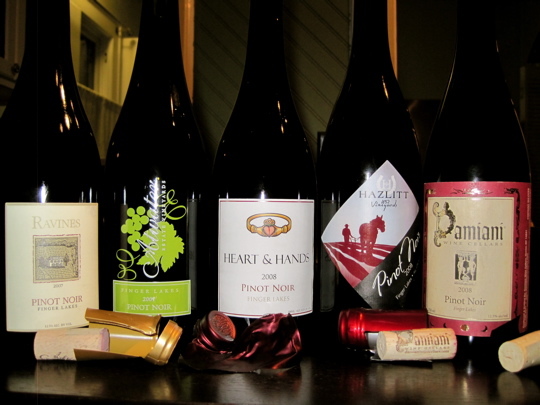 The Hazlitt 1852 Vineyards 2008 Pinot Noir, the promising Heart & Hands Wine Company 2008 Pinot Noir, and the young Atwater Estate Vineyards 2007 Pinot Noir were mixed on tasting sheets for positions 3 through 5. In summary, the event was a big success and helped open my eyes to the Finger Lakes. 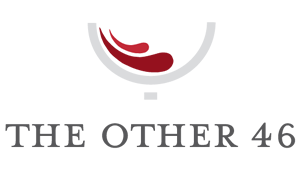 A special thanks to Lenn Thompson and Morgen McLaughlin for introducing a new and exciting Pinot Noir region. Cheers! Great meeting you this weekend, Brian. You’re in for some FLX riesling in May, yes? For TTL, I recommend using TweetChat.com. You pick one hashtag and it tracks it for you (it’s all you see) AND it adds it to your tweets automatically. Likewise Lenn! I would love to participate in the FLX Riesling in May! I’ll give TweetChat.com a try. For whatever reasons, TweetDeck couldn’t keep up. Cheers!